A- Again, the artwork is amazing on the label and a very masculine bottle to boot! The beer itself is a crystal clear reddish amber color with an amazingly looking soapy head that doesn't retain itself very well, however, it leaves behind a thin film over the beer itself and it itself is white in color. Carbonation is very modest and lacing is quite nice, with many circular bits of foam clinging to the side of the glass. S- The obvious and prominent aroma happening is smooth creamy ginger....it's a natural smell that has a somewhat medicinal quality to it. Spicy, buttered and slightly sweet root overall....nothing much else to report here! T- Very smooth ginger flavoring happening, and the heat comes after the swallow...you think it's finished but it grows and is warm down the pipe....the big difference between this and other ginger beers I've had is this has a gradual, honeyed sweetness beyond the slight heat......super nice overall! M/O- This is a very highly drinkable beer that would do well with me in front of the fireplace in the middle of winter! I'd like to have this with Asian cuisine and will warm the cockles of your heart upon a bottle.....I could enjoy this medium bodied, mildly carbonated beer all night....highly regarded and another well crafted beer by Wychwood! Cheers! Strong raw ginger root hits you right up front and clears the sinuses. You can also smell a light sweet malt profile and some hops - Goldings? - coming through. There is a pleasant dough that rounds things out and helps the ginger from becoming too overpowering. As it warms the aroma remains remarkably consistant. Light amber/ginger color. Clear. A medium amount of bubble rising. Very thick foaming head with extremly long retention. It is like a root beer float kind of head. If the beer could be a bit less foamy I could actually pour it better. The foam sticks nicely to the sides but washes away easily. Medium body. Smooth. High carbonation. A pleasant tingling of the tongue that one should get from a spicy ginger beer. There is no evidence of alcohol here. This could easily just be a high quality non-alcoholic ginger beer. It has exactly what it needs to be one - spicy ginger with interesting flavors. The English Ale base is definitely evident here and mixes well with the spicy candy ginger. Some might want the ginger to be more subdued and to provide a better balance - but that would ruin this beer entirely, making it too weak. Personally, I adore ginger and am excited to finally have a true ginger beer (read: alcohol is in it) that meets up to my high expectations for the style. We have a six pack of these 1 pint bottles and I am very excited to use the next one to make high balls with Pim's No. 1 Cup. A bright gold colour, the pours brings about an inch of foam that leaves nice lacing. Talk about truth in advertising, the smell is loaded with ginger. I have know clue to as what the base beer could be. Initial flavour I pick up is some sweet malt soon overcome by the main focus of this brew...ginger. Spicy, yes. And that's the gist of the beer. Fairly light bodied with lightish carbonation. It's an interesting experiment but I reckon I prefer the normal ginger beers, without any alcohol. It IS tasty so I can't really slam it. Bottle: Poured a clear light amber color ale with a medium size off-white foamy head with medium retention and light lacing notes. Aroma of spicy ginger notes with light dry cereal notes is OK. Taste is actually quite interesting with nice ginger roots notes with light spicy finish. Body is light with good carbonation. I understand this is not a great beer but I find it quite enjoyable when you are in the mood for a highly drinkable spicy drink. The bottle says "Fiery Alcoholic Ginger Beer", but it just ain't so. If it said "Soapy Syrupy Alcoholic Ginger Beer" it would be a lot closer. Fiery ginger beer is that old school or Caribbean stuff. This brew has only got the merest whiff of that, so it oversells itself that way by more than a little. Pours a fizzy 1 cm head that dissipates in short order. No ring, no lace, no nuthin'. Clear amber coloured brew. A little bite from carbonation. Syrupy sweet, ginger flavour. Just too sticky overall. Aftertaste like soap. Feh. Not real good. Amber colour, mediuim head and retention, good lace. Aroma: ginger. Maybe some fruity notes. Light body, creamy texture, good carbonation. Taste: ginger. And maybe some fruit. A more yellowy colour notwithstanding, Ginger Beard is evidently proud to be ginger - bright red highlights are boastfully displayed and entirely uninhibited thanks to pristine clarity and a well burnished complexion. Its heavy carbonation is obvious even though no head forms. I most often experience ginger one of two ways: either in fiery Asian dishes or in ginger-ale and Caribbean sodas; this smells remarkably like the latter. The zestiness of the ginger is still appreciated but very mellow, any and all of its intensity tempered by sugary sweetness. The heat is slightly dialed-up on the palate, but is still considerably mild. The syrupy, fountain pop-like texture is not only off-putting in and of itself but also mutes the ginger's piquancy, robbing us the real experience of its peppery, pungent gusto. Even more diminished than the ginger, however, is the beer. There's not a trace of actual malty flavour. A can of ginger-ale would have been much cheaper and provided the *exact* same experience. While they're both equally bad for your teeth, at least the pop spares my liver. In small doses, Wychwood Ginger Beard could provide some refreshment on a hot day; it would likely make a serviceable addition to or substitution for a shandy. Beyond that, I'm out of ideas as to how to put a positive spin on a what is honestly a pretty worthless offering. 500 mL bottle picked up at the LCBO and served well-chilled; best before March 31 2015. With the warm weather finally in full swing, it seems about the right time of year to start trying new ginger beers. Pours a bright, golden-amber colour; clear in hue and topped with two fingers of puffy, soapy white head that fizzles away steadily over the next minute or two. Cobwebs of sticky lacing adhere to the glass. The aroma contains a fair amount of ginger spice, but it's rather sweet as well, giving the overall bouquet a candied ginger root vibe. Not bad, but it'd be nice if it had some company. Well, this is rather disappointing. The ginger is there - with more intensity and heat than on the nose, at least - but beyond that there is not much else to say about this beer's flavour. It is annoyingly sweet, with barely any malt backbone available to counter the sugar. Ginger spice hangs on briefly into the aftertaste. The mouthfeel is quite sticky and syrupy, which is exactly the sort of feel I do NOT want in a light summer ginger beer. On the light-side of medium-bodied, and not terribly refreshing. Final Grade: 2.94, a forgettable C grade. 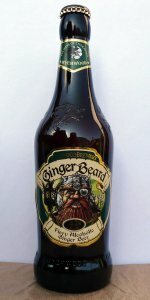 Wychwood's Ginger Beard is easily the worst offering I've tried from this brewery, and probably the lamest alcoholic ginger beer I've ever had. It's not exactly offensive, but it is a dull, uninspired offering with tooth-rotting sweetness that I don't expect I'll return to again. It became more tolerable as I made my way through the glass (mostly because the ginger heat slowly builds up, and I'm a fan of that). This one definitely needs some work before I'd recommend it to anyone - you're better off sticking with Crabbie's - or hell, why not Vernors? Brown 500ml bottle best before 17 June 2012, poured into a UK pint sleeve Sep 2011. Looked fine at first: bright amber body with a full white crown on top, sadly the crown faded away to leave a thin wisp and collar very quickly. I might be being unkind, but to me this was just a sweet gingery tasting liquid that I didn't enjoy one bit. I knew what I was buying, but I just expected a bit more effort in the brewing, not an unbalanced mess of alcohol, sugar and root ginger. A: The beer is crystal clear golden yellow in color and has a light to moderate amount of visible carbonation. It poured with a half finger high white head consisting of large bubbles that died down rather quickly, leaving some lacing on the surface and a thin collar around the edge of the glass. S: Light to moderate aromas of spicy ginger are present in the nose. T: In this initial sip of this beer, you get immediate flavors of ginger and hints of sweetness that almost make it seem like you're drinking ginger ale. The sweetness then begins to dissipate and is replaced by slight hints of spices towards the finish. The spicy ginger flavors linger through the aftertaste. The beer seems to become spicer as it warms up. M: It feels light- to medium-bodied and a little syrupy on the palate with a moderate amount of carbonation. O: This beer has a good amount of ginger flavors and associated spiciness, but the syrupy mouthfeel is somewhat of a detriment to its drinkability. 500ml bottle. Nice Tolkien-esque dwarf staring menacingly from the label. This beer pours a clear, medium golden amber hue, with one finger of tightly foamy, somewhat creamy eggshell white head, which leaves a decent craggy lava flow pattern of lace around the glass as it evenly subsides. It smells of sweet powdered ginger, with a moderately zingy spiciness, pale grainy malt, a touch of muddled nutmeg/clove, and a soft citrus juiciness. The taste is semi-sweet candied ginger, thinly bready pale malt, musty orange juice, and a subtly growing vegetal heat, one that plateaus early enough, though. The bubbles are quite sedate, the body medium-light in weight, and mostly smooth, but for a hovering, though somehow hollow earthy spiciness. It finishes off-dry, the sugary ginger and lame malt parrying the waning zest with a modicum of difficulty. While not as fiery as the label might lead you to believe, this still has more kick than any ginger beer in recent memory. Unfortunately, the malt is too anemic, and those musty vegetation notes kind of put a damper on the whole deal, evoking associations to stale ginger ale. Pours amber with a small head. Lots of ginger in the aroma, little else underneath, just some faint vegetal notes. Sweet flavours, with some biting ginger as well. A bit cloying. Seemed refreshing at first but the sweetness is over the top. 500 mL brown bottle poured into a pint glass (tumbler). A: deep auburn in colour; nice white head that dissipates fairly quickly leaving no lacing. S: smells very similar to a typical non-alcoholic ginger beer--very sweet with a touch of ginger spice in the nose. T: again, very similar to a normal ginger beer--not much ale/beer taste. It's there but hidden beneath the layers of gingery sweetness. M: lots of fizzy carbonation, moderate heavyness, but nice and refreshing. O: Enjoyable but not incredible. Modest half finger head of just off-white foam, for what’s there it has good retention, the lacing though is wispy and ends up more like dots. The liquid is pure and transparent, a washed out rust orange hue, more red than yellow, the bubbles are few and widely dispersed. There’s a little soft maltiness to the nose but, of course, it’s a ginger fest, raw dough to freshly cooked bread and molasses, maybe some apple fruit but it sticks closely to ginger, ginger and more ginger. Full-bodied and arguably heavier than expected, the carbonation seems light through the attack but by the time you swallow it’s foaming up inside your mouth. More grain to cereal here than bread, cocoa lurks in the background, molasses, orange peel, maybe nutty at turns. The ginger brings a pleasing heat, not overboard. Given its weight and the punch of the ginger the finish is short. Could use an element designed to sweeten the end and reduce the sting. Otherwise, it’s inoffensive and a notch above simple. Unlike a previous reviewer's, my bottle's label calls its contents a "fiery English beer with ginger added", so perhaps they're toning down the rhetoric a bit? Regardless, this stuff pours a clear bronze topped by a finger or so of relatively short-lived glowing off-white foam. The nose comprises a blast of ginger ale (the soda, that is) backed by a bit of lightly-funky barley. The taste definitely leads with the ginger as well, but its more muddled now, with some Pine-Sol, cucumber, and a hint of seaweed (admittedly, this may just be my brain making connections between ginger and seaweed from my sushi escapades, but it's at least constant), all still backed by that oddly lightly-funky barley. Compared to other ginger beers (and even beers with ginger added as a side note), the ginger isn't as bright, as fresh, as "fiery" as it apparently could be. Maybe we Americans have gotten a gingered beer instead of a ginger beer...? The body is a light medium, with a light moderate carbonation and a fairly drying finish. Overall, an okay ginger-y beer at best, one that definitely doesn't hold up to Crabbie's and other big ginger hitters, but one I could see people enjoying if they are into Left Hand's Juju and the like. I, for one, likely will not revisit this stuff, though. 500 mL bottle into a St. Bernardus chalice. Bought for $4.50. Pours slightly hazy sunburst orange. Minimal head. Smells of floral ginger, a tiny touch of earthy hops and hand soap. The flavor is rather a pleasant surprise considering my expectations from other reviews. Ginger (more like dried powder than fresh root in flavor) hits first, followed by a simple but nice blend of sweetness, earthy hop bitterness with a touch of flavor, and some generic malts. The ginger really isn't bad, but could have a fresher flavor. Very little aftertaste. This is less carbonated than expected, with surprising sweetness and bitterness. Neither are awesome and I would probably like it more if it didn't taste sweet or bitter, but just more balanced. Certainly not bad though. I have never tasted hops and ginger together. The combination works okay, but is almost like a cleaning agent in flavor. This association hurts the whole experience, but overall this is working alright. This was a very poor beer. The ginger overwhealms the rest of the beer and it is more a ginger lemonade than a beer. A - Pours a light golden colour, thin layer of head, little retention and no real lacing. S - Fresh ginger... Candied sugar... That's about it! T - Sweet ginger ale, spicy heat lingers on the finish with bready malt and candied sugar. M - Medium bodied, smooth and wet. O - Super sweet and literally reminiscent of ginger ale soda, the only difference being a touch of heat on the finish. ABV is undetectable, making this easily mistaken for soda. Not my cup of tea, too sweet and not enough of a malt backbone. Pours clear deep golden with fizzy white head, low retention. Smell of ginger alone. Taste of ginger alone, very sweet, visceral burst guaranteed, ginger outshine all beer characteristics of the beverage. Too sharp, to rate it adequately. I'm not impressed, as it has lost necessary balance.